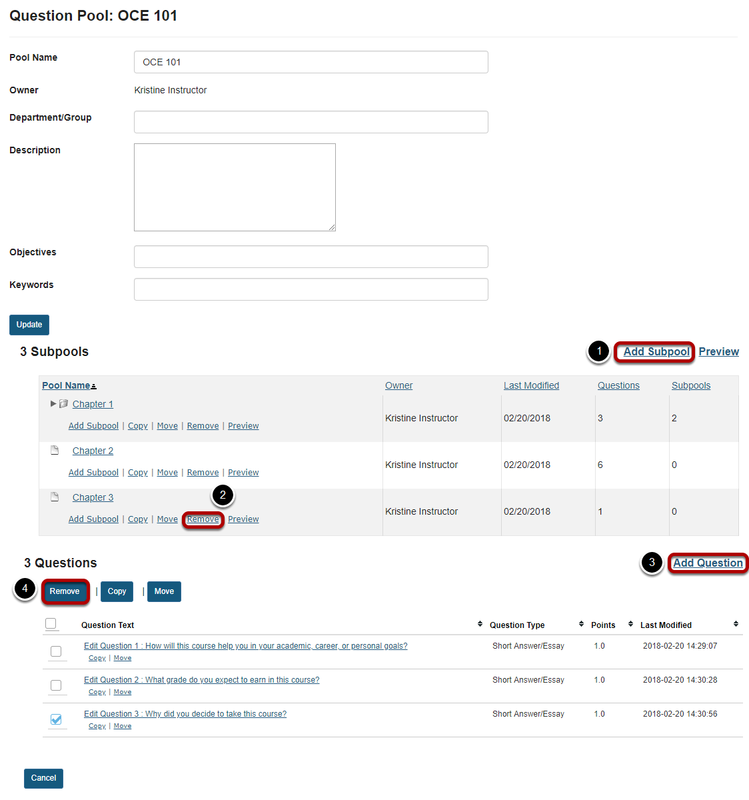 Sakai Guides and DocumentationSakai Complete User Guide Tests and QuizzesWhat is a question pool? A question pool is a set of questions, identified by a name, that belongs to you (not the worksite). You can share a question pool with others, and others can share theirs with you. Questions pools are set up in advance of an assessment, for convenience. When you are ready to give your students an assessment (a test or quiz), you can pull questions from your pools and also from pools that have been shared with you. Question pools serve as the basis for random-draw questions. To give each student a different question on the same subject, set up a question pool with several equivalent questions on that subject, and then add a random-draw question using that pool. Question pools can be subdivided into subpools, and those subpools can be further subdivided, for organization that reflects your teaching methods. Here we see a question pool (e.g. OCE101) that contains three questions at the top level and also subpools for Chapters 1, 2, and 3. Chapter 1 also has two subpools of its own (Multiple Choice and Short Answer/Essay). Tip: A question pool can contain both questions of its own and subpools. You will see question pools that you have authored as well as question pools that have been shared with you by their authors. Note: Question pools are not identified by course site, as they are associated with a specific owner rather than worksite. Contents of a question pool. Zoom: Contents of a question pool. Clicking on the name of the pool, in this case OCE101, shows its subpools and questions. To add a subpool to the current pool, click Add Subpool. To remove a subpool, click the Remove link under the name of the subpool to be deleted. To add a new question to the current pool, click Add Question. 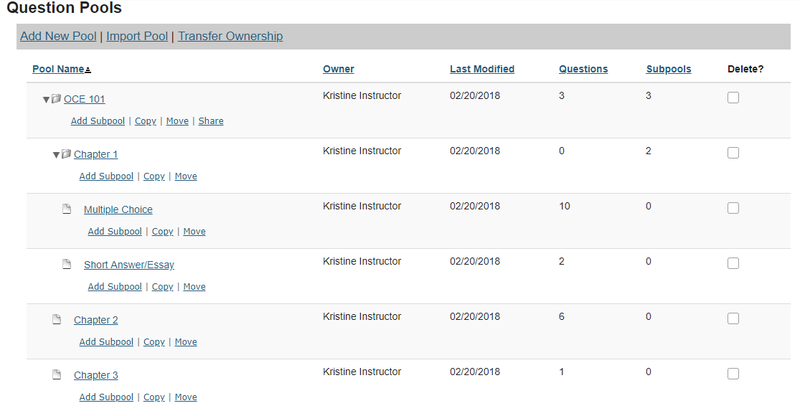 To remove a question from the pool, select the question or questions to be removed and then click the Remove button in the questions listing area. To create a new Question Pool, see How do I add, copy, move, or remove a Question Pool? Prev: How do I use assessment parts? Next: How do I add, copy, move, or delete a question pool?